Lengthy detective work with data NASA's Mars Exploration Rover Spirit collected in late 2005 has confirmed that an outcrop called "Comanche" contains a mineral indicating that a past environment was wet and non-acidic, possibly favorable to life. Spirit used its panoramic camera to capture this view of the Comanche outcrop during the 689th Martian day, or sol, of the rover's mission on Mars (Dec. 11, 2005). The rover's Moessbauer spectrometer, miniature thermal emission spectrometer and alpha particle X-ray spectrometer each examined targets on Comanche that month. 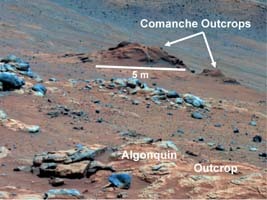 On June 3, 2010, scientists using data from all three spectrometers reported that about one-fourth of the composition of Comanche is magnesium iron carbonate. That concentration is 10 times higher than for any previously identified carbonate in a Martian rock. Carbonates originate in wet, near-neutral conditions but dissolve in acid. 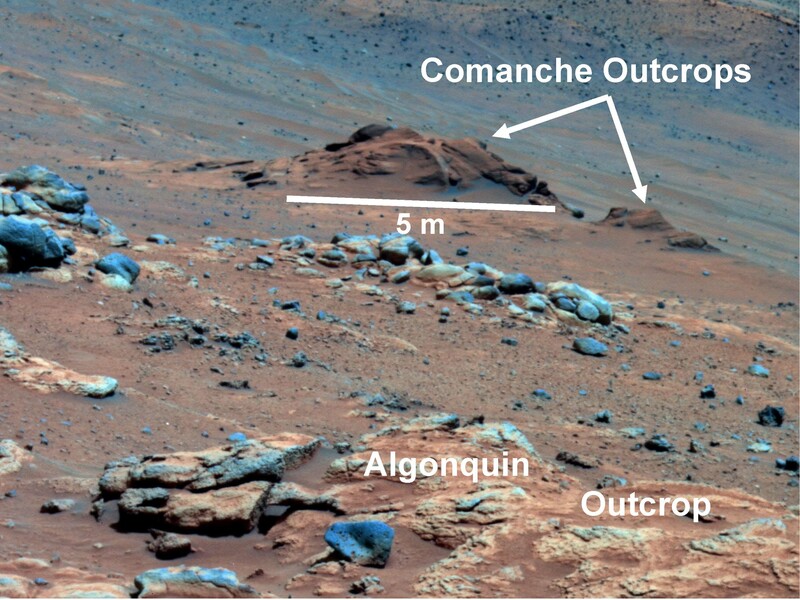 The find at Comanche is the first unambiguous evidence from either Spirit of its twin, Opportunity, for a past Martian environment that may have been more favorable to life than the wet but acidic conditions indicated by the rovers' earlier finds. In this image, Comanche is the dark reddish mound above the center of the view. The image is presented in false color, which makes some differences between materials easier to see. It combines three separate exposures taken through filters admitting wavelengths of 750 nanometers, 530 nanometers and 430 nanometers. The main Comanche outcrop is about 5 meters (16 feet) from left to right from this perspective. The paler material visible at bottom right is part of another outcrop, "Algonquin."